Spring is coming so it’s time to break out the rainbow activities! You can’t not feel happy looking at rainbow art by preschoolers and I found 10 different activities that will keep the kids busy and your walls full of color! Rainbows are a popular preschool theme for a reason–there is so much learning that can be done with them! Kids can learn about colors, color mixing, cause and effect, science, weather and more all from playing with rainbows. Shaving Cream Rainbows. This one has been a favorite at our house for years. Explore color mixing with shaving cream paint and then use the color you create to paint fluffy rainbows. Rainbow Snowballs. If you still have snow then you will love this fun outdoor rainbow art activity from The Pleasantest Thing. Painting Rainbows with Marshmallows. Doesn’t the title make you want to stop and try it right now? Learn Play Imagine shows you how to make beautiful marshmallow print rainbows. Rainbow Window Art. I cannot wait to try this art project from hands on : as we grow! All you need is colored cellophane or tissue paper to create this gorgeous window art. Rainbow Car Paintings. Cars + rainbows +paint = lots of fun! Grab your favorite toy colors and washable paint and have fun making rainbows with toy cars. Rainbow Sponge Painting on an Easel. This art activity from Teaching 2 and 3 Year Olds is a wonderful way to explore the cause and effect by switching out the paintbrush for a sponge to make rainbows and play with color. Black Glue and Salt Watercolor Rainbows. Experiment with texture with this gorgeous rainbow art from Mess for Less. Rainbow Resist Art. Learn Play Imagine made rainbow resist paintings! This is always a kid favorite and I loved her advice about letting kids make their own decisions about their art. Scrap Paper Rainbows. Do you have leftover valentines or other cards lying around? Toddler Approved used theirs to make scrap paper rainbows! Paper Towel Rainbow Art. Teach Preschool made paper towel rainbows with her students and then sprayed them with water to see what would happen–so cool! 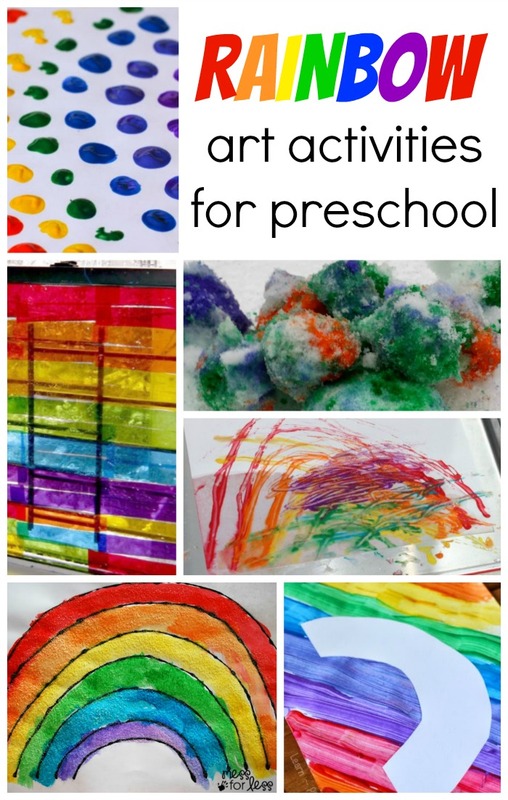 There are so many fun rainbow themed art activities that you can do with preschoolers! I am in love with all of these rainbow activities! Me too!!! Bring on spring and rainbows! Oh, what great ideas for rainbow activities! I love them! Me too Mary Catherine!!! Thanks!